At last weekend’s AGM, Suzanne Shriner was re-elected President, Cecelia Smith is Vice President, Karen Zulkowski is Secretary and Jim Monk is Treasurer. The suggested Bylaw change for Article V.3 was accepted by the majority of the KCFA General Membership attending the Annual Meeting. Originally By Law: Article V.3 stated: Board members shall not hold office in any other Hawaii coffee organization. Article V.3. Board members shall not hold office in any other Hawaii coffee organization unless authorized by vote of the Board of Directors. Such authorizations must be renewed annually by the Board. As always, our goal is to support the mission of KCFA, and we are open to any thoughts or concerns you have. Please email us at info@konacoffeefarmers.org. It’s been an interesting year for your Association. But before I talk about the numbers, I want to thank Jenine Boido, our Accountant, who keeps our books so we can know where we stand at all times. As of December 31st, our total assets were a bit over $57,000, and we can pay all our bills. Our total assets went down a bit more than three thousand dollars in the past year. This is the deliberate result of your Association continuing to fund those programs that support the purpose and mission of the KCFA, in spite of income being less than expenses. On the income side, our membership dues were a solid $6,500. Thanks to everyone for that! Our merchandise sales brought in a net $5,700. We also received over $10,000 in grant money to cover a number of our expenses. Total net income was over $25,000. But this past calendar year we had expenses of a bit over $28,000. Our largest single bill in the year was to pay for the event coordinator who ran our Coffee Expo – and that was covered by the County grant. Overall, our largest expense category was our annual Coffee Expo – which is coming up again at the end of March – plan to attend! We also provided funds for our members to attend a Slow Food Expo in Denver and to travel to Honolulu for the Made in Hawaii show. One of our continuing expenses is renting a storage locker to keep our inventory of merchandise and meeting supplies. 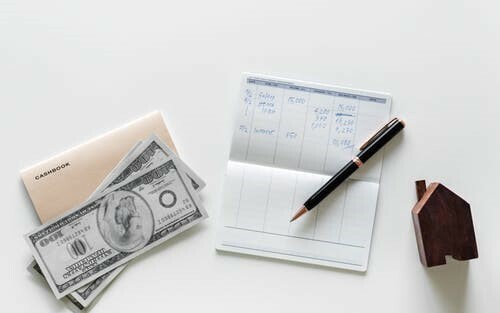 The bottom line was a loss for the calendar year of about $2,600. But we are doing OK. We are doing our mission and keeping you represented. 1–Scientists are developing ever more precise methods for detecting coffee fraud—methods that are available to authorities in Hawaii and on the Mainland to combat the counterfeiting of prized origin coffees—including Kona Coffee. 2–The “economic gain” identified in the Quadram survey as going to marketers who mislabel and counterfeit coffee products directly reduces the income of coffee farmers. 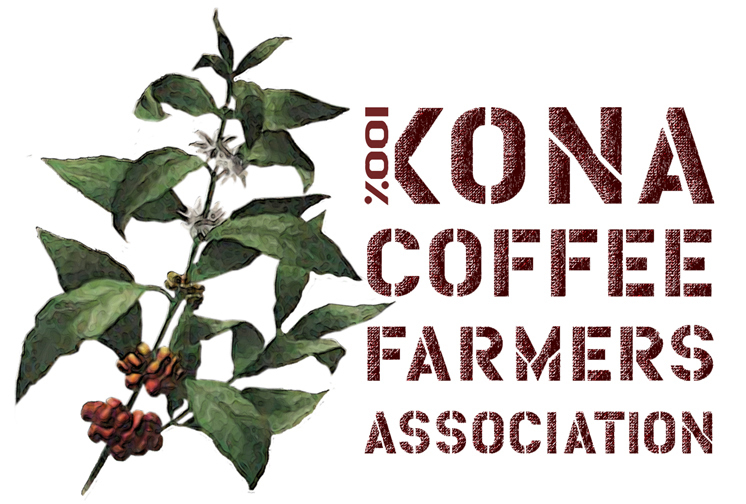 The Kona Coffee Farmers Association is looking for a great new KCFA T-shirt design. We know you artists are out there in our Membership! Get inspired by going out and walking around your coffee farm. Please email your sketch asap to info@KonaCoffeeFarmers.org with the subject “T-shirt Idea”. The final date for submitting your art work is February 27, 2019. So, don’t delay! The final winner or 2 will be picked by our newsletter Editor Clare Wilson an artist, and KCFA President Suzanne Shriner. The lovely prize for the winner(s) will be a year’s free Membership in the KCFA and a T-shirt of your own that you designed. We hope to have our brand new T-shirt ready for our EXPO on March 30, 2019. We could have more than one winner so just let your mind go and think of KCFA members and friends, walking around in your design. We don’t need to hire no designers, we have YOU! Mahalo! Now that the intensity of coffee harvest is over, it’s a good time to get your Annual Reimbursement for Beauveria bassiana receipts taken care of. If can, go online and fill out the Application and Grower Survey at www.surveymonkey.com/r/NT62HLW and I will call you for an appointment. If no can, contact me for the paper application hdoa.cbb@hawaii.gov or (808) 323-7578 or Rm. 7 at Captain Cook Civic Center. For those off-island, we may be able to handle it remotely. We are currently reimbursing receipts between 7/1/17 – 6/30/18 at 50% up to $600 per acre and capped at $6,000 per farm business. Happy Pruning! Thank you Kay Dixon, one of the women’s march organizers which took place Saturday Jan 19 here in Kona, for inviting King’s Cup 100% Kona Coffee to be part of your event. 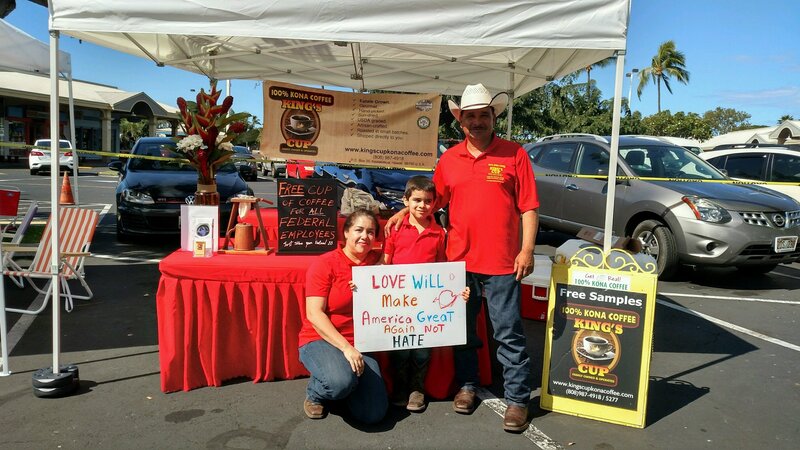 We served free cups of Kona coffee to any federal employees and marchers who stopped by our booth. To all government employees: Thank you for your service. In a continued effort to promote and protect Kona coffee around the world, it has been with great pride that efforts continue with the American Origin Products Association (AOPA — http://www.aop-us.org/), of which KCFA is a member. As the current Board President, we are holding an annual membership meeting in Washington, DC on April 9, 2019. 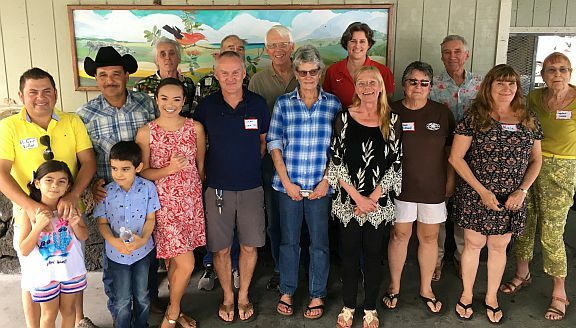 Goal is to continue to build membership (which has more than doubled in the past year and is expected to double again as of this meeting), to seek sponsors and partners, and to reach out to legislative offices/national legislators to recognize and protect products, like Kona coffee, of designated geographical origin. For a sense of where we are at, representatives are expected not only from Kona Coffee, but as well from Idaho Potatoes, Wisconsin Ginseng, Vermont Maple Syrup, New Mexico Chili Peppers, Willamette Valley Vintners, Vidalia Onions, California Dried Plums, SICPA (see www.sicpa.com), Humboldt Growers Alliance, Long Island Vintners, Oregon Wine Alliance, and others who are in discussion at this time. The rational in play is that in this process we can and should get national legislative and departmental recognition, and thereby be able to be listened to when conversations are had about protection and promotion of such products nationally and internationally. Office staff as well as legislators will attend our meeting and thereafter be in better communication. For this reason, global-focused oriGIn (who KCFA is also a long-term member of), has been willing to step up and help finance the AOPA administrative expenses involved (including paying an Executive Director), which has meant that at this meeting with the Director of oriGIn (www.origin-gi.com) present, we can and will discuss why it is so important for the USA voice and how we can and will affect international trading agreements and partnerships, which are directly related to how the Kona coffee name and reputation is perceived worldwide. To this end as well, KCFA Board members (led by Kay Dixon, Karen Zulkowski and myself) have agreed, and budgeted, to have our organization hold, for the third year in a row, booth space at the Slow Food Nations event in Denver, CO (see www.slowfoodnations.org). At this event it is possible to talk with many people from around the world who understand and support knowing where food comes from, and what keeps it resoundingly positive as a geographical origin product. If any members and/or readers would like to donate green 100% Kona coffee for this years’ event in mid-July, and/or can volunteer to be in Denver for the event itself, please reach me directly in order to effectively prepare and plan (colemel2@gmail.com). The Specialty Coffee Association (SCA) produces several handbooks related to coffee and supported by the extensive research undertaken by this international nonprofit organization. Coffee freshness is the subject of one of the handbooks. Preheat oven to 350. Line muffin tins. Combine flour, oats, baking powder, baking soda, salt and nutmeg [if using] in a large bowl. Whisk together, and make a well in the center. Combine buttermilk, coffee, oil, vanilla, sugar and eggs. Whisk wet ingredients together and pour over the dry ingredients. Mix wet ingredients together until almost mixed. Add bananas and cacao nibs, and finish mixing until just combined, being careful not to over mix. Scoop batter into prepared pans, filling the muffin cup to the top. Sprinkle with sugar. Bake until muffin edges are golden brown and a toothpick inserted comes out with the tiniest bit of crumb, 16-20 minutes. LET US KNOW WHAT YOU THINK! >> Write to us. We welcome Letters to the Editor up to 150 words. We reserve the right to edit for clarity and length. 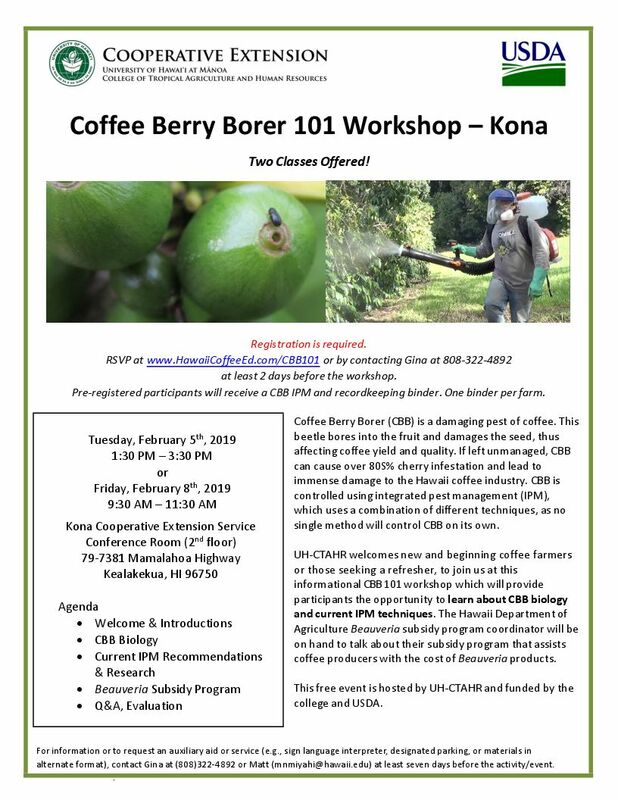 Include your name and email address >> Email: info@KonaCoffeeFarmers.org with SUBJECT: Commentary.